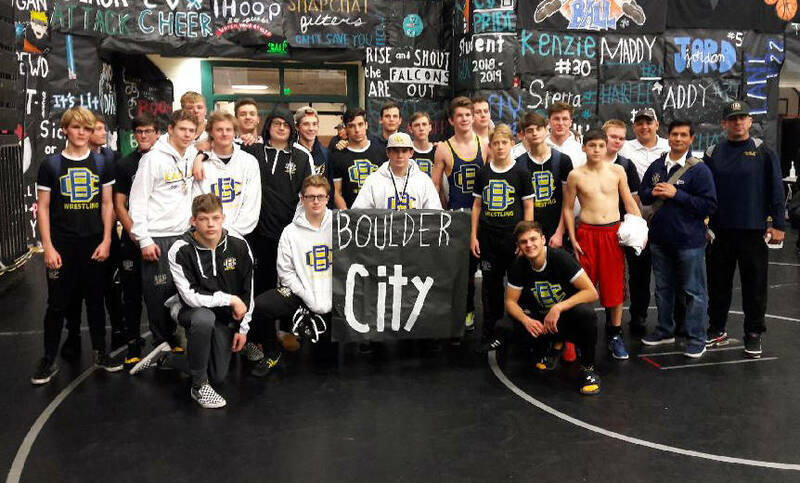 (Kim Cox) The Boulder City High School wrestling team won the silver bracket at the Iron Town Duals in Cedar City, Utah, on Saturday, Jan. 12, 2019, finishing with a record of 6-2. Rallying off six consecutive wins after dropping their first two contests, the Eagles were led by senior 190-pound wrestler Jimmy Dunagan, who finished the tournament 8-0 and junior 152-pound wrestler Ladd Cox, who finished 6-2. Finishing the tournament with 5-3 records were senior Hayden Moore (160 pounds) and juniors Jason Krumm (120 pounds) and Danny Pate (145 pounds). Juniors Curtis Brown (126 pounds) and Cade Cowley (170 pounds) finished 4-4. Also winning a pair of matches against 4A opponents, the Eagles defeated Shadow Ridge 43-36 and Basic 59-18 on Jan. 9. Picking up victories against both 4A programs were senior Ryan Vanario, Dunagan, Moore and Ladd Cox. Against Shadow Ridge Krumm and Brown picked up victories, while Cowley got a win against Basic. Setting their focus toward another large tournament, the Eagles will compete in the Chaparral Invitational this weekend, followed by a road meet at Virgin Valley on Tuesday, Jan. 22, and senior night against Chaparral on Wednesday, Jan. 23. Boulder City High School girls basketball team split its pair of games this week, playing consistent basketball. Falling to rival Virgin Valley 45-40 on Tuesday, Jan. 15, the Lady Eagles fought back from a 16-9 first-quarter deficit but were never able to pull even with the Bulldogs. Playing her best basketball of the season, junior forward Ellie Howard scored a game-high 17 points, while senior forward Setia Cox added 9 points. Junior guard Keely Alexander scored 8 points in the losing effort. Getting the better of Pahrump Valley on Friday, Jan. 11, the Lady Eagles held off the Trojans for a 31-29 victory. Despite being outscored 11-6 in the fourth quarter, the Lady Eagles held on behind a 16-point effort from senior guard Hannah Estes. Playing at home for the first time in a month, the Lady Eagles will host Sky Pointe tonight, Jan. 17, followed by a road game at Chaparral on Wednesday, Jan. 23. Boulder City High School boys bowling team locked up the No. 1 seed for the playoffs, defeating Sunrise Mountain and The Meadows on Jan. 9 and Monday, Jan. 14, to close out the regular season strong. Defeating the Miners 2,033-1,362, the boys were clicking on all cylinders behind sophomore Jamison Kaboli (630), freshman William Wallace (570) and senior Samuel Holt (503). Defeating The Meadows 2,107-2,004, Kaboli bowled a 694, including an impressive 255 in the third match. Holt added a score of 537, while Wallace bowled a 527. Unable to match the same success, the Lady Eagles fell in both matches. Losing to Sunrise Mountain 1,025-963 on Jan. 9, senior Samantha Wagner led the way with a score of 289, while junior Kali Martin bowled a 243. Wagner bowled a 312 against The Meadows on Monday, Jan. 14, which wasn’t enough to pull the team ahead in the 1,432-1,119 defeat. Martin bowled a 272. Wednesday, Jan. 23, vs. Chaparral, 6 p.m.